An important part of running a business is the process of procuring and maintaining employee information. The flow of this information begins with obtaining details of pertinent personal, job, and emergency contact information. An Employee Information Form is designed to collect these important details and should be completed every time an employee is hired. Having these details conveniently stored in a document allows companies to access information quickly when needed. Since the Employee Information Form prompts response, it is important employers provide a well written and direct form. A great way to ensure the form meets company standards is by using a template. Utilization of a template will provide organization and uniformity across company files. 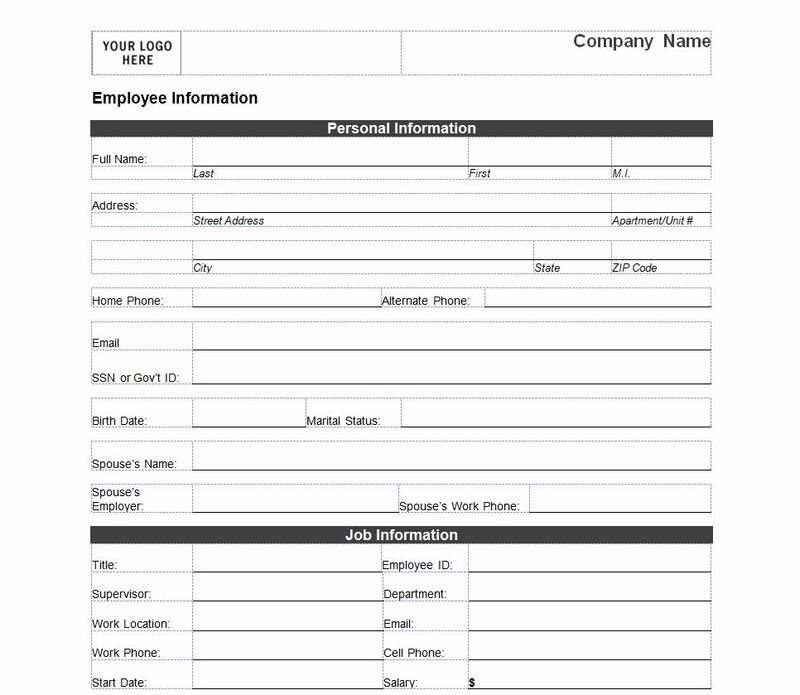 The Microsoft Word Template offers a free Employee Information Form template available for download right here. The template downloads complete with personal, job, and emergency contact information sections and can be customized. First, edit the header of document with specific company information. There is assigned space in the template for Company name & Company Logo. To customize Company Name: 1. Select “Company Name” text that was provided in the download template 2. Delete the text 3. Type your company name. To customize Company Logo: 1. Click on the “Your Logo Here” box. 2. Select the Insert tab in top ribbon. 3. Click on the Pictures icon in the Illustrations section. 4. Select the picture of your logo that is on file and click insert. Second, review information in each section of the template and adjust accordingly to your company needs. Third, review and save the document as a template for future use. The header will adjust to the Logo’s image size, adjust company Logo appropriately. Try to keep the form to one page, if this does run into another page consider printing double sided to avoid the risk of information being separated. Please make an extra effort to inform users that the completed and filled in Employee Information Form holds sensitive information and should be handled with confidentially.